Quoting from the Rhino3d website: Start with a sketch, drawing, physical model, or only an idea — Rhino provides the tools to accurately model your designs ready for rendering, animation, drafting, engineering, analysis, and manufacturing. NURBS surfaces? Rhino 3D can create, edit, analyze, and translate NURBS curves, surfaces, and solids in Windows. There are no limits on complexity, degree, or size. Rhino 3D also supports polygon meshes. Rhino 3D easily imports into any of the big three engineering packages such as Catia, Pro/Engineer and SolidWorks. Toolable data? Accuracy needed to design, prototype, engineer, analyze, and manufacture anything from an airplane to jewelry. Rhino 3D provides the tools to accurately model and document your designs for rendering, animation, drafting, engineering, analysis, and manufacturing or construction. Tools like those found only in products costing 20 to 50 times more. 2D drafting, annotation, and illustration. In addition, flatten 3D surfaces into 2D patterns and drive laser, plasma, and water jet cutters. 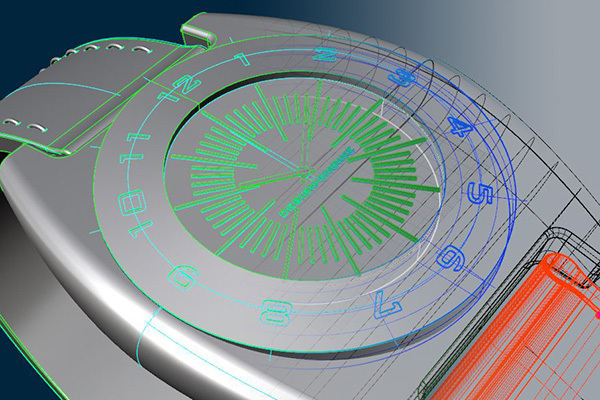 Plus, companies like Motorola and Fisher Price have their industrial designers on Rhino for creating concept models. Rhino is the tool of choice for many designers. Many design firms use Rhino 3D to iterate design then import into SolidWorks or Pro/Engineer. Designers all over the world use Rhino. Industrial Designers? Many design firms use Rhino. Product design firms such as IDEO, Designworks, BMW, Beyond Design, HLB, and Lunar Design. Manufacturers like Black & Decker, Bissell, Lego, bombardier, Nike, KI, Yamaha, Fisher-Price and Microsoft Corp to name a few. Furniture Designers? Furniture Designers use Rhino all over the world because of the tools available to the designer. Plus the Rhino geometry can be imported into Pro/Engineer and SolidWorks which is usually an end deliverable. Sail and Yacht Designers? The boating industry uses Rhino for developing hull geometry to the interiors. Oil and Gas Giant tankers use Rhino 3D as well (many jobs in Louisiana and Southern Texas). Jewelry Designers? Jewelry designers use rhino because it can generate tool path geometry for miniature CNC machines.